We’d love your help. Let us know what’s wrong with this preview of Stress by Steven Haymon. To ask other readers questions about Stress, please sign up. Stress in our lives is inevitable. We have stress of family, work, children, friends, financial, marriage - you name it, we stress about it. Dr. Haymon's book shows us how to cope with stress. He brings biblical principles and biblical characters out in order to show us how they coped with stress. He uses the life of Paul to bring out how Paul learned to rely on God and His teachings. He learned to be content with whatever God gave him. Sometimes we feel that God may not be listening to us in tim Stress in our lives is inevitable. We have stress of family, work, children, friends, financial, marriage - you name it, we stress about it. Dr. Haymon's book shows us how to cope with stress. He brings biblical principles and biblical characters out in order to show us how they coped with stress. He uses the life of Paul to bring out how Paul learned to rely on God and His teachings. He learned to be content with whatever God gave him. Sometimes we feel that God may not be listening to us in times of stress or bad things. But God is there. We need to learn how to cope and rely on God. He will take care of us when it is His time and for our good. One thing he writes is, "Stress is the perception of what is happening rather than what's actually going on." Sometimes in our lives, we feel that everything is out of control. It is during this time that we need to remember that God is always in control. Just because it feels like we are not control - God is. He knows what we need and what we can do. This book has helped me to learn about boundaries. We must set some in order to help with our stress levels. We must take the time to pray and trust God instead of adding more things into our lives which can add more stress. 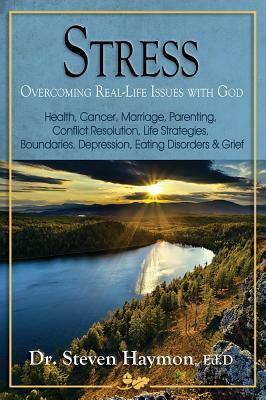 "Stress Overcoming Real Life Issues with God" is a good book dealing with the every day stresses that we all face. God has created and equipped each of us with what we need to fulfill what He desires from/for us. It is so important that we focus on Our relationship with God rather than focusing on our emotions. God is never changing. Our emotions are always up and down, changing at any given moment. Steven Haymon has done a good job helping me see how important it is for me to set boundaries in "Stress Overcoming Real Life Issues with God" is a good book dealing with the every day stresses that we all face. God has created and equipped each of us with what we need to fulfill what He desires from/for us. It is so important that we focus on Our relationship with God rather than focusing on our emotions. God is never changing. Our emotions are always up and down, changing at any given moment. Steven Haymon has done a good job helping me see how important it is for me to set boundaries in my job and family. He reminds me that my relationship with God must be my priority! My strength comes from God alone, and in order to maintain that strength, I need to be healthy emotionally, spiritually and mentally. The message this book imparts is so full, one I hope many will take the time to discover. The need for a personal relationship with God and living up to the potential He has given each of us to fulfill the purpose He has for us is an invaluable tool to overcoming anything thrown in our path, be it something God intends for us to learn from or a stumbling block the enemy intends to use to deter us. It is evident in this book that Dr. Haymon has a heart for God and is concerned for the world at large. I enjoyed Dr. Haymon's use of scripture to illustrate the stress present in the lives of many Biblical characters as well as the analogies he uses to illustrate how stress is affecting people in everyday life. Many understand how stress affects us mentally, emotionally, spiritually and physically. Its intensity and pressure needs to be addressed or greater difficulties result. However, stress can also harmfully affect other dimensions of our daily lives which we rarely consider. This valuable resource dissects life's circumstances and the impact of stress. Using sound Biblical principles and scriptures, it equips readers to understand and overcome life's challenges. Each reader will be empowered with the tools to combat the effects of stress as it relates to marriages and relationships, parenting, financial habits and activities, Career Choices, Employment, Workplace Violence, Grieving and many specific health issues. This self-help/spiritual resource has been designed to help individuals, marital couples, families, pastors, counselors, therapists and others who work in the helping professions. The principles within this book hold the key to living a healthier and quality lifestyle, leading to better relationships with others, self and God. This book has been strongly endorsed by military personal, clergy, physicians and a broad range of mental health professionals. Dr. Steven Haymon brings his passion, ministry and almost 40 years experience as a psychotherapist/ consultant to his work with people across the country on issues related to stress. He leads workshops/ trainings with churches, businesses and military groups. With an Ed.D.,Educational Psychology and an M.S.W.,he's completed Christian Educational course work at Bethesda Temple Bible Institute. a very inspiring book on how we can overcome stress that could lead to a debilitating illness by relying on God and his teachings fully and completely. The author has done an excellent job talking us through these different stressors and what we are to do when faced with impossible setbacks in our lives, where if we make the wrong decisions concerning them, they can lead to devastating loss. This book is an essential right now, because with everything going on in this world, we tend to lose focus. God is always withing a prayer's reach if we would just trust Him to take care of us then stress could be a thing of the past. Everyone has some sort of stress. We can’t get away from it. The difference we have is how we handle stress. Sometimes stress can manifest as an illness, we can lose our hair, we can have a mental break down or we can just simply give up. Dr. Haymon defines stress and provides ways to combat stress without losing yourself. Dr. Haymon shares the Word of God and discusses how the Word can help you put everything into perspective. This is definitely something I should have read years ago but since Everyone has some sort of stress. We can’t get away from it. The difference we have is how we handle stress. Sometimes stress can manifest as an illness, we can lose our hair, we can have a mental break down or we can just simply give up. Dr. Haymon defines stress and provides ways to combat stress without losing yourself. Dr. Haymon shares the Word of God and discusses how the Word can help you put everything into perspective. This is definitely something I should have read years ago but since it was published in 2013…I read it right on time. Now that I have tools and scriptures I know that I can handle any stress that comes my way. I plan to give this as gifts to all of my friends in the coming months. This book was given to me in return for my honest opinion. Stress Overcoming Real-Life Issues With God. Wow I have not been able to read this book without someone's comment, "what's in that book " "can I read it" "where can I get one" The title Stress gets gets ones attention right? because we all have to deal with stress in many forms. Living healthy in the mist of stress is what the book is all about. I highly recommend this valuable resource it addresses many common issues, and directs us to God who has control of our lives. I suggest you give this go Stress Overcoming Real-Life Issues With God. How many of us find ourselves surrounded by stressful real life everyday issues in this age that we live in. In an uncertain world. Do we realize that stress can affect us spiritually, physically and emotionally? Dr Haymon's book gives us the information and scripture verses that we need to fight against stress in our daily lives. His book is inspiring and I like that he included a scripture index. This book will help us to focus on God, who is in control. To trust Him and be prayerful. I Stress!! This book will help us to focus on God, who is in control. To trust Him and be prayerful. I think it would be a great tool for a church study group. The stressors of daily life can be overwhelming. They can lead to all types of illness. Dr. Steven Hayman's book shows how if we focus on our Lord instead of our stress, life becomes much easier. We can fight the stress of the world by putting our trust in the Lord. The book use scripture to illustrate how to do this. Dr Hayman uses the Apostle Paul and his life as an example throughout the book of this trust. I found the book relevant in today's world where you need a means to cope or the stres The stressors of daily life can be overwhelming. They can lead to all types of illness. Dr. Steven Hayman's book shows how if we focus on our Lord instead of our stress, life becomes much easier. We can fight the stress of the world by putting our trust in the Lord. The book use scripture to illustrate how to do this. Dr Hayman uses the Apostle Paul and his life as an example throughout the book of this trust. I found the book relevant in today's world where you need a means to cope or the stressors in life will bog you down. The book is informative, and interesting. I so loved this book, it was the best book I ever read on Stress and overcoming lifes trials with God as the focus of our healing. I would recommend this book to everyone ! It is a book that is hard to put down, you just have to keep reading it. Christians have stress - often made worse because they think they shouldn't have any. Haymon looks at biblical characters, what caused them stress and the tools they used to overcome it. This is not your typical book on stress, making better priority lists etc. This is a book about trusting God and seeing your circumstances from His viewpoint. See my full review at http://bit.ly/1blMXgK.